After a year of operation, the Nghe An Investment Promotion and Business Support Centre (Nghe An IPC) has quickly stabilised its organisational structure, actively advised the Provincial People’s Committee and energetically cooperated with relevant departments, branches, localities in investment, trade and tourism promotion and business support consultancy in Nghe An province. Vietnam Business Forum Magazine has an interview with Mr Le Tien Tri, Director of Nghe An IPC. How do you assess the performance of Nghe An IPC after one year of operation? The Nghe An Provincial People’s Committee proposed the establishment of Nghe An IPC, approved by the Prime Minister in Decision 2465/QD-TTg dated December 16, 2016, on the basis of reorganising of Nghe An Investment Promotion and Development Consultancy Centre affiliated to the Department of Planning and Investment. Nghe An IPC is tasked to advise and assist the Provincial People’s Committee to carry out investment promotion programmes; support, consult and coordinate to facilitate investment promotion procedures to draw more investment flows into the province. The establishment of Nghe An IPC is expected to make a breakthrough in administrative reform in a move to build e-government, deploy online public services, and speed up investment promotion and utilise local potential advantages. Immediately after going into operation, Nghe An IPC counselled the Provincial People’s Committee to promulgate regulations on functions, tasks and organisational structure of Nghe An IPC and regulations on coordination of Nghe An IPC with relevant departments, districts, cities, towns and agencies (defined in Decision 4926/QD-UBND dated October 19, 2017 of the Provincial People’s Committee). It also consulted the provincial government to amend Decision 06/2015/QD-UBND on regulations on the order and procedures of implementing investment projects in Nghe An province. Nghe An IPC also gradually expanded its assigned professional works, for example, advising on the successful organisation of the 9th Spring Investors Meeting 2017. The centre updated and standardised investment promotion materials, including introductory documents on local strengths and potential and the list of key projects in need of investment capital in Nghe An province up to 2020; and studied and appraised potential investment cooperation with traditional markets such as South Korea, Japan and Singapore to advise provincial leaders on cooperation with each partner. It also coordinated with VSIP Group to open workshops on investment promotion into VSIP Nghe An Industrial - Urban - Service Area in Malaysia, Hong Kong, South Korea and other places. 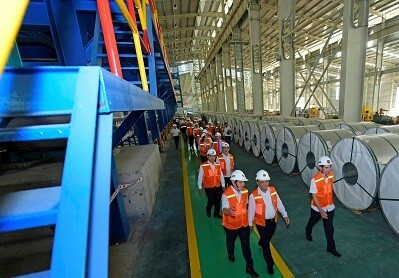 Nghe An IPC advised provincial leaders to hold working meetings with partners and stepped up investment connections with investors from Japan, South Korea, Thailand, Poland and other nations. Besides, Nghe An IPC directly consulted and assisted investors when they dealt with administrative procedures at the Cross-agency Single-window Division and provided consultancies via email, telephone and in writing for many investors at the request of the Provincial People’s Committee as well as of investors. The centre initially completed the process of offering consultancy services to establish standard project files. It also coordinated with districts, cities and towns concerned, and project investors, kept up with the reality and progress of projects, learnt about existing hardships faced against investors, proposals and recommendations from them, and prepared work programmes, report contents for regular meetings of provincial leaders; monitored every project to timely update the progress, capture new difficulties and work with relevant agencies to devise solutions for investors and report outcomes to the Provincial People’s Committee. In addition, Nghe An IPC coordinated with VCCI Nghe An Branch to organise a workshop to seek ways to improve the Provincial Competitiveness Index (PCI) and inspire initiatives to develop competitiveness index at district and department levels (called DDCI - Department and District Competitiveness Index) in Nghe An province, joined hands with People’s Committees of Vinh City, Dien Chau District, Do Luong District, Hung Nguyen District, Cua Lo Town and other localities to consult on investment locations for T&T Group, TMS Group, Dat Xanh Mien Trung Joint Stock Company, TNG Group, Livestock Breed Development Company Limited - an affiliate of TH Group. These works initially produced certain results. Nghe An IPC has assumed the task of receiving and returning results according to the cross-agency single-window mechanism since June 2017, a new step in administrative reform and investment attraction. Would you be kind enough to tell us the new points of this division when it is operated at Nghe An IPC? Firstly, the relocation of the Cross-agency Single-Window Division from a State management agency (Department of Planning and Investment) to a public service delivery unit (Nghe An IPC) proved Nghe An province’s determinations to administrative reform in a bid to control all settlement processes of State management agencies in handling documents filed by investors, and thus reduce the time and expenses for investors. Secondly, the Cross-agency Single-Window Division is currently comprised of the Director who is also the Director of Nghe An IPC, Deputy Director, and two full-time officials. Particularly, the Cross-agency Single-Window Division now has four staff members assigned by the Department of Planning and Investment, the Department of Construction, the Department of Natural Resources and Environment, and Fire Prevention Police to receive documents and deliver results of document settlement. Thirdly, the guidance, reception and delivery of results is done at only the Cross-agency Single-Window Division where independent administrative procedures can be settled concurrently to shorten the overall processing time. The guidance, reception and settlement of administrative procedures shall adhere to the principle of inheriting prior procedure settlement results. Fourthly, the Cross-agency Single-Window Division is responsible for monitoring, inspecting, urging the processing of settling filed documents and reporting outcomes to the Provincial People’s Committee and the Chairperson of Provincial People’s Committee. Since its operation on June 19, 2017, the Cross-agency Single-Window Division has officially received documents from enterprises, investors and concerned organisations and individuals when they carry out investment administrative procedures. The division has well received and forwarded documents to responsible agencies for settlement according to regulations. As of November 10, 2017, the division took over 643 sets of documents and handled 430. The rest are being processed, including 42 documents returned for amendment and supplement, and 47 overdue and unresolved documents. In case of late delivery, the centre timely informed investors of their document status, explained reasons to them, apologised for the lateness and scheduled a new delivery. How is the Cross-agency Single-Window Division operated? Who does it serve? And, what are solutions to upcoming public administration reform? The operating mechanism of the Cross-agency Single-Window Division is defined as follows: Investors need to go to only one place to submit administrative documents and get results, that is, the Cross-agency Single-Window Division located at the Nghe An Investment Promotion and Business Support Centre whose address is 3rd Floor, No. 3 Truong Thi Street, Vinh City (inside the Office Building of the Provincial People’s Council and the Provincial People’s Committee of Nghe An). The Cross-agency Single-Window Division serves all organisations, enterprises and investors with investment projects in Nghe An province. To create a better business and investment environment to boost development, in the coming time, Nghe An province, through the lead agency - Cross-agency Single-Window Division, requests an active engagement and timely, effective coordination of all departments and branches to make breakthroughs in administrative reform to speed up investment promotion activities, tap local potential advantages and realise the Resolution of the 18th Provincial Party Congress and Resolution 26 of the Politburo on directions and tasks for Nghe An development.